A Rollerbrake is a kind of drum brake. The RollerBrake is cable-operated, but as with coaster (backpedaling) brakes, the braking surfaces are all metallic, and they are grease-lubricated. The Rollerbrake is most practical for urban cycling in areas without long, steep descents. Advantages are that is weatherproof and requires little maintenance. It also is replaceable as a unit -- unlike other drum brakes which are inside the hub, so the hub, and as a practical matter, usually the entire wheel -- is replaced if the drum is worn out. Several models of Rollerbrake of different sizes have been sold. Even the smallest Rollerbrake can skid the rear wheel of a solo bicycle. The images of several Rollerbrakes below are all at the same scale. Rollerbrake IM70. Note heat-dissipating fins on back. Because Rollerbrakes are grease-lubricated like coaster brakes, they add a bit of drag even when not applied. There are front Rollerbrakes available, but, in our opinion, a conventional cantilever brake is better for the front. We do not particularly recommend the Nexus front brake. A Rollerbrake has cylindrical rollers around a central, multi-faceted cam. The rollers press three brake shoes outward against the brake drum, for a more even distribution of outward force around the drum than with a conventional two-shoe drum brake. Thanks go to Henry Cutler of Workcycles in Amsterdam for the photo below which shows the internals of a Rollerbrake -- from the middle outwards, the cam, six rollers (partially hidden under the retainer which positions them), three brake shoes and half of the external shell. The brake drum fits over the top of this assembly and around the brake shoes. The other half of the shell fits over the brake drum and holds the assembly together. In the photo, you can see a couple of tabs which have been pried up to open the shell and allow the brake drum to be lifted off. Waiter, please: Rollerbrake on the half shell! A rear Rollerbrake's reaction arm attaches to the left chainstay using a clamp, or sometimes a brazed-on or welded-on fitting. The special fitting for a front Rollerbrake is shown in the photo below. It goes without saying that the cable to a front hub brake on a suspension fork must be run in housing, but the cable to a front hub brake with a rigid fork must also be run in housing, because flexing of the fork during braking can tighten the cable and lock the brake. We leave it to your imagination what will happen if you ignore this advice. The Rollerbrake is installed in place of the rubber cap and flanged washer, and secured in position by the same nut. Splines on the brake drum engage the ones on the hub. 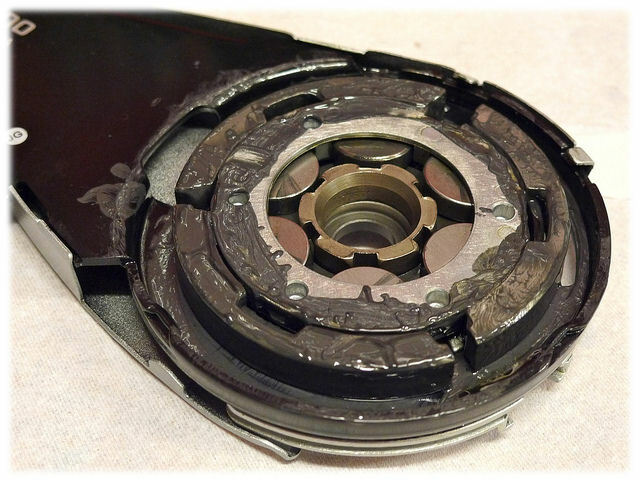 Some Rollerbrake models require a spacing washer between the drum assembly and outer nut -- check which ones may apply to your combination of brake and axle. A link to technical documents is later in this article. The reaction arm (at left in the photo below) must be securely attached to the left chainstay or fork blade. Leave the nut that holds the Rollerbrake only finger-tight, and leave the left axle end nut loose until you have installed the hub in the dropouts and secured the reaction arm to the chainstay. The nut which secures the Rollerbrake projects above the face of the shell, and can then be tightened with a 17 mm cone wrench. An easy mistake to make is to forget to tighten this nut, and only tighten the axle end nut (the one at the outside of the dropout) against this nut. Then the brake will be loose on the axle, and the shell can tilt and rub on the rotating brake drum assembly. A locknut with a shoulder (red arrow in the photo below) holds the adjustment of the hub's left bearing cone and supports the Rollerbrake, or the flanged washer. If no Rollerbrake is installed, you can reduce the overlocknut dimension by leaving the cap and flanged washer off, but then you must replace the shoulder locknut with a nut which has a larger surface to press against the dropout. You could use the nut which held the cap and flanged washer in place, or a thinner locknut. The axle threading is 3/8 inch (9.5 mm) x 26 TPI. Some weather protection for the hub bearing is lost if the rubber cap or Rollerbrake is left off. Unscrewing the bearing cone to add grease is a good idea when making this modification. You might also install a different weather barrier, for example a rubber O-ring. The Rollerbrake works with most common brake levers, other than levers intended for use with direct-pull brakes. The lever must be able to pull at least 14.5 mm of cable. Attachment of the cable to a Rollerbrake varies, though there is usually a cable housing stop with an adjusting barrel on the reaction arm. With some front Rollerbrakes, the cable-housing stop attaches to a brazed-on fitting on the front fork. The inner cable may clamp directly under a nut on the brake, or to a fitting with an anchor bolt which attaches to the cable. 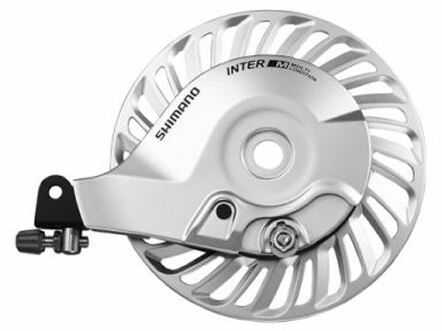 Specifics are covered in the Shimano technical documents linked in the next section of this article. Again: the cable to a front hub brake must run down the fork blade inside a cable housing. Flexing of a fork blade due to braking can tension an open cable, locking the wheel. Rollerbrake dealer's manual (applies to many but not all models). A Rollerbrake should be relubricated periodically, using special Nexus brake grease -- there's a small rubber access plug on the side of the brake unit. You can just pop off the plug, put the nozzle of the grease tube up against it, and squeeze. A grease gun with a short nozzle will not do the job well, because it does not squirt the grease in far enough. You could use a needle which goes in as far as the Shimano tube does. Such needles are most commonly used to inject grease inside the rubber boots of automotive universal joints. The life cycle of a brake goes something like this: add small amount of grease (pea size amount) in addition to factory grease when installing a new brake. After some months, the grease is washed away by rain. The brake is now dry and has poor or nonexistent modulation which locks the wheel with the slightest pressure on the lever. A normal consumer would regrease the brake immediately at this point, but our bikes [bike-share fleet bikes] can go a few weeks between being checked by staff. If it is being ridden dry for weeks, the drum and/or shoes are damaged beyond repair. 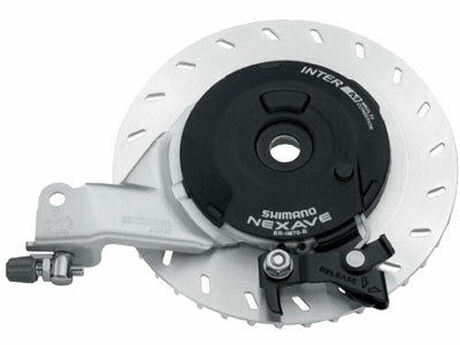 Regreasing at this point can bring the brake modulation back to normal levels temporarily, but the brake will lose all stopping power within a few weeks or months depending on how much it is ridden. 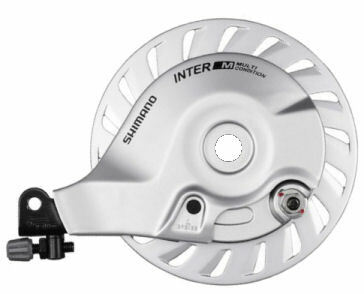 Rebuilding of Rollerbrakes is not supported by Shimano, but mechanics have figured out for themselves how to do it, and so to extend the life of the brake. To disassemble a Rollerbrake, spread the tabs to separate the shell as shown in the photo above. Remove the circular spring clip which retracts the brake shoes, and the brake shoes. You may leave the rollers and roller retainer in place. Aaron Goss, of Aaron's Bicycle Repair in Seattle, has sent the two photos below of Rollerbrakes, fully disassembled and cleaned. These photos may be helpful when rebuilding a brake. The photo below is of a small, front Rollerbrake. 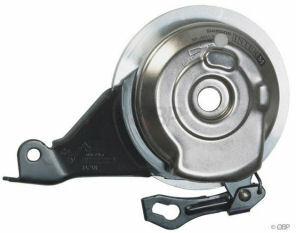 Some higher-end Rollerbrakes have brake shoes with peaked (roof-shaped) braking surfaces. The brake must be disassembled further to get these brake shoes out, and these brakes are also more difficult to reassemble. 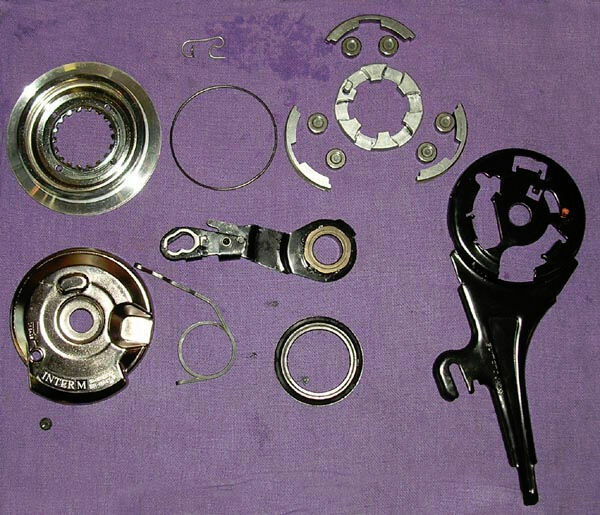 The photo below is of an BR-IM70R rear brake, the same one shown in the image at the top of this page. This is a large Rollerbrake with peaked brake shoes. 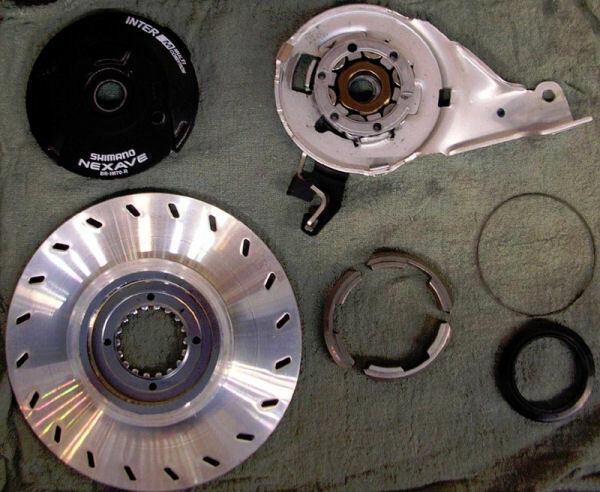 There are links below to a Web page and a video about disassembly and reassembly of such a brake. The video's narration is in Russian but the procedure is clear enough from the images. Clean out the old grease with solvent. Coat the inside with Phil Wood oil and pack it with high-temperature grease before reassembling. People who are especially concerned for efficiency will leave the grease out, and use only the Phil Wood oil -- though it can drip out and make a mess, and must be replenished more frequently. With some Rollerbrakes, the shoes must be held outward against the drum to keep the circular spring clip in place. A page linked below shows how this may be done. As the	shoes of a Rollerbrake wear, slack in the cable will increase, as with other brakes. Readjust the cable using the adjusting barrel, and as necessary, by pulling more cable through the anchor bolt. The brake is worn out when the cable cannot be adjusted to apply the brake fully, or will not retract. Shimano has a wear measuring tool. See the maintenance manual in the list above for details. If a Rollerbrake is worn out, the entire main assembly must be replaced. Shimano doesn't offer spare parts. External parts -- nuts, bolts, adjusting barrels, clamps etc.-- are available for replacement. Shimano tech Web site -- structure and function, troubleshooting charts etc.